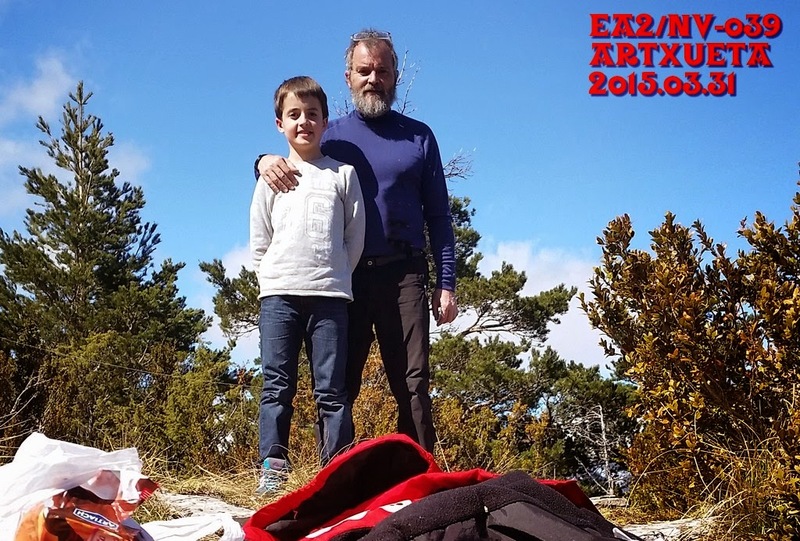 This past Easter holidays we -my son Oier and me- made a new trip around EA2/NV. The goal was to reach some new summits of this beautiful territory were Basque range and Pyreenes meet. This time, three were the summits to activate, two of them new for me, one never activated before: Artxueta EA2/NV-032, San Zolo EA2/NV-039 (new), and Monjardin EA2/NV-121. 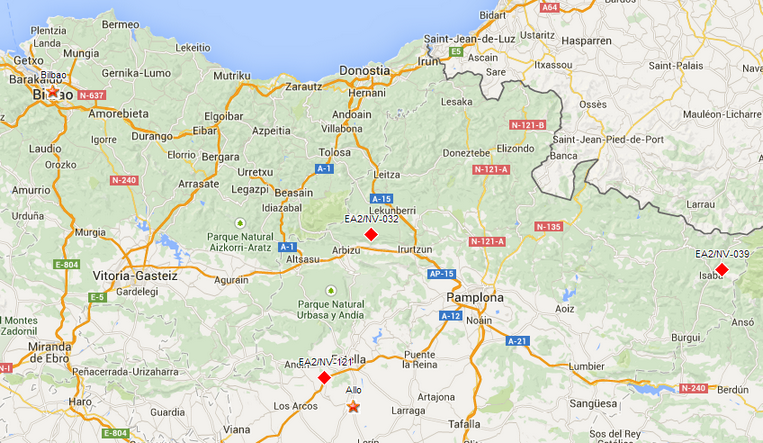 On monday 30/3/2015 we left Bilbao, arriving to Huarte Arakil some two hours later. Mt. 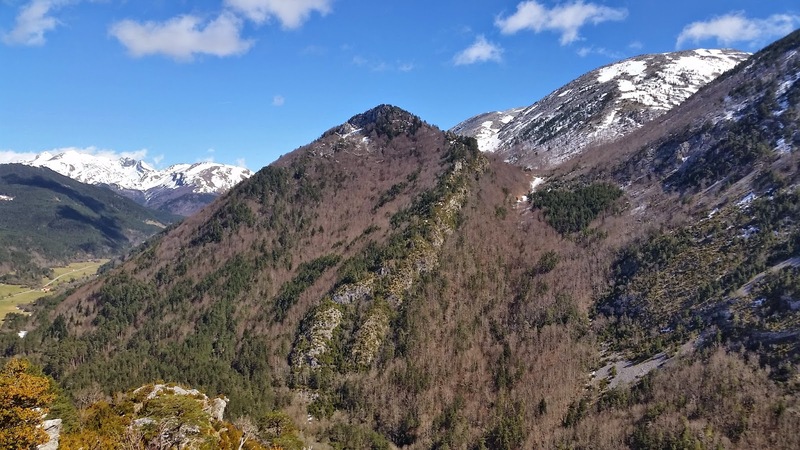 Artxueta (1.321m asl) was located very close to St. Miguel of Aralar (IX cent. ), beatiful sanctuary were some of the chains of Teodosio de Goñi (VI-VII cent.) are. These chains appear also on the Navarra shield of arms, and there are deep rooted traditions concerning them. So, after paying a visit to the church and surroundings, we started the short hike to the summit. The path is a wide and well paved road, although was partially covered by some large snow patches. After a 20 minutes walk, we arrived to the summit, fully occupied by radio, cellular and tv repeaters. The temp was not too low, but the wind was strong and sleet was falling around, making it quite uncomfortable. The rig was quicky set up. A norcal doublet antenna on a 5 m fishing rod, and HB-1B CW QRP @4 watts transceiver made it all. About 30 minutes calling, 15 QSOs were bagged. 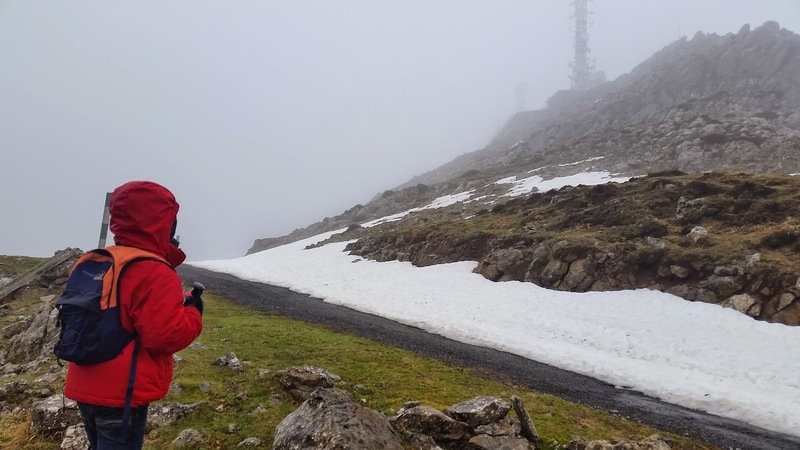 The conditions were not too good, but enough to validate the summit. Fast backpaking, and down to the monastery. Beside it, there is a large and well mantained shelter, were we could have our lunch. Just after, we continued our trip to Iruña-Pamplona, capital city of Navarra where the famous "San Fermines" are celebrated every year. There we spent the afternoon visiting the old zone, and the town hall. to my sister's at Allo were we meet Oier's cousins for passing that afternoon and night. 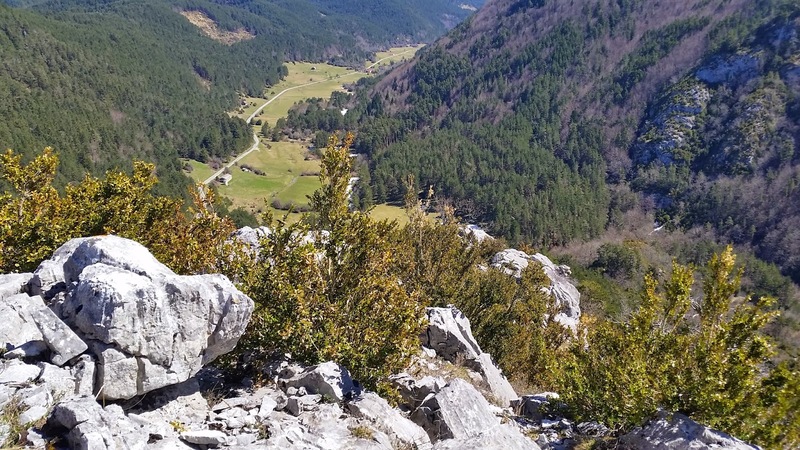 Next thursday 31, after having fast breakfast with all the family, we started the long trip to Isaba at the south foothills of Pyrenees, almost bordering to Huesca. After 2 hours, we arrived there. 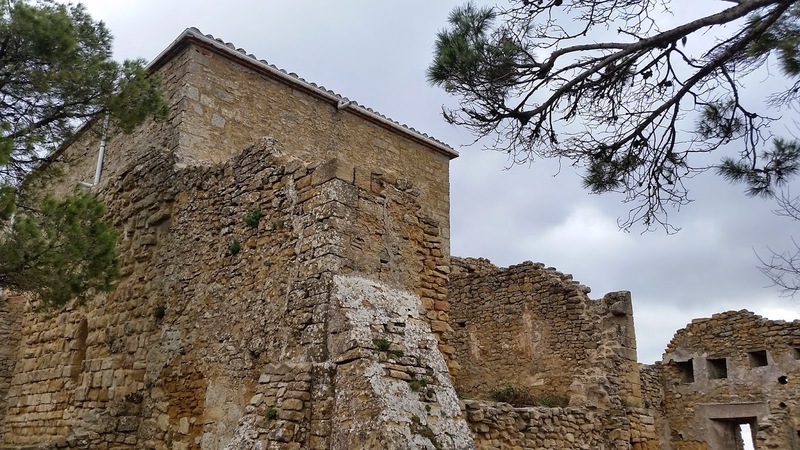 Isaba is a typical small navarre town from where you can reach Belagua, a beautiful sort of valleys up to the highests summits on EA2/NV, such as Orhi, Three Kings Table, and so. A small road (NA-2000) to Zuritza drove us to Belabarze gully, where a small shepherds hut marks the start of the path to San Zolo EA2/NV-039. This summit has been never activated before, probably due to the difficult hiking. 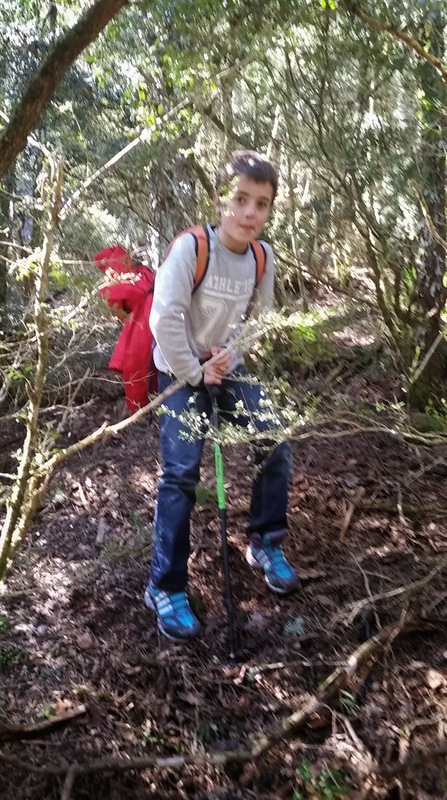 When planning the hike, we read that there is not a defined path, with some short forest and plenty of close scrub. The easiest way is starting from the north across the wood, following later a thin ridge up to the summit. As we were advised, the hike was quite hard, making it 2h30min to hike just 1.2 km. We had to find our own way across the strong branches. but luckily, the weather kept nice, with the sun shining all the time. Just near the summit, we arrived to a more cleared zone, that started to give us the most amazing views of the surrounding peaks up to 20 km away. Even under the plain sun, the temperature was not too hot, and some clouds were threaten us from the north. As we expected a long trip back later, the activation was not very long. Just another half hour to bag 29 QSOs under not the best bands conditions. The antenna was not very well set up too, as the dense brushes didn't allow it. 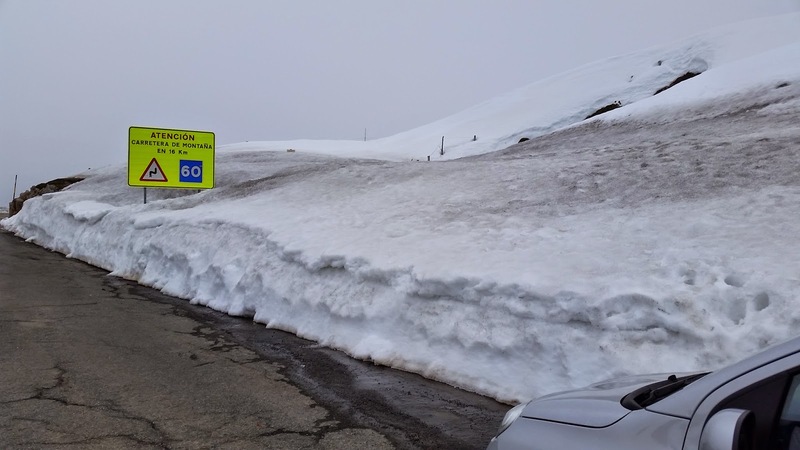 Two hours were necessary to make the way back, just on time to pay a short visit to Belagua heights, were the weather was pretty colder, with more than 5 meters of snow on some places. From there, two hours trip back to Allo, where we arrived quite late, for just a short family meeting, dinner and showing before going quick to bed. 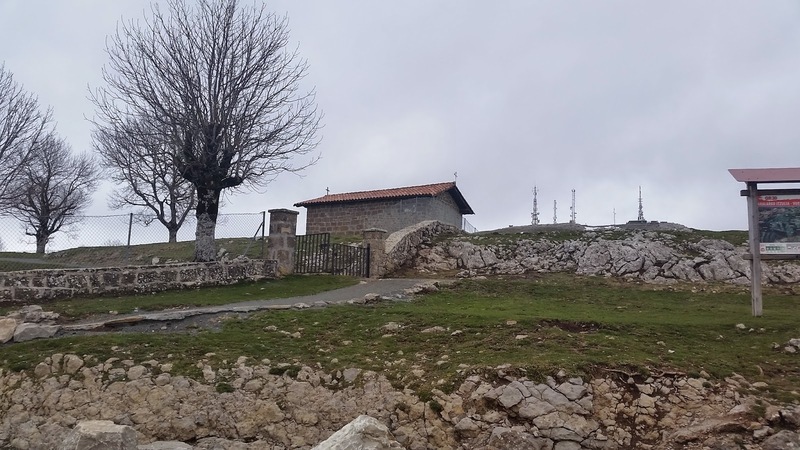 Next day, wednesday, we had to go back to Bilbao, but on the way we were able to spend a couple of hours for a nice and longer activation at the near summit of Monjardin (Mount Garden) EA2/NV-121 where an ancient fortress has been watching over the zone from the roman times until present day. After giving our names at the village tavern, we were given the castle keys for paying a visit to the ruins. 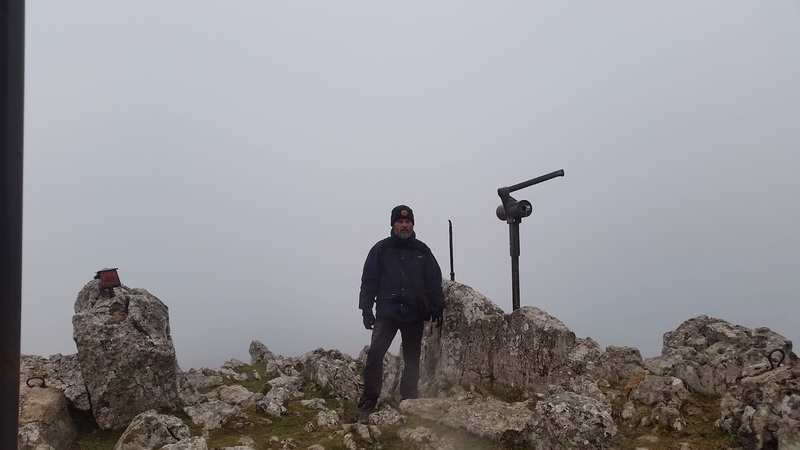 While Oier was inspecting the summit, and after I tried to make some contacts on 145 FM without success, I was able to make a bigger amount of QSOs on HF CW that at the previous summits for a total of 41. This was our 3rd activation of this summit, as it is easily accessed on our route to Bilbao (2 hours more trip).